With advancements in medical imaging technologies, the demand for radiology systems in the field of dental healthcare will continue to witness an upsurge. Persistence Market Research’s exclusive report on the global dental radiology equipment market projects that by the end of 2026, nearly US$ 3.2 Bn worth of imaging systems will be sold for dental radiology across the globe. These equipment (products) include extraoral x-ray systems, intraoral x-ray systems, cone-beam computed tomography imaging, and intraoral plate scanners. Difficulties and limitations associated with intraoral radiography in terms of providing comfort to patients intolerable towards placing the films in their mouth has driven them towards extraoral x-ray systems. As an alternative approach, extraoral x-ray systems can easily meet the performance standards applicable for other dental radiology equipment. 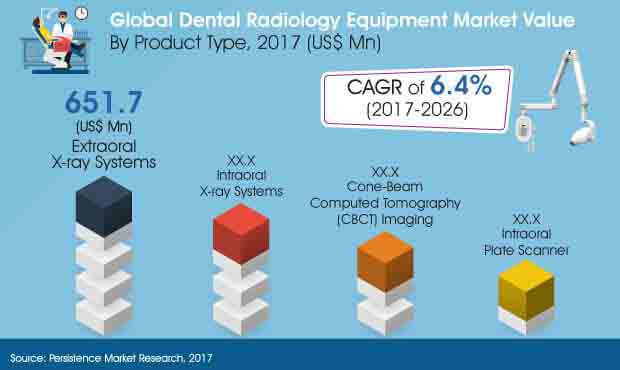 Effective imaging facilitated by x-ray beam alignment, well-supported tube housing assembly, beam-on indicators, and a controlled radiation exposure of extraoral x-ray systems will continue to factor their surging sales in the global market for dental radiology equipment through 2026. Moreover, these equipment can employ a range of imaging techniques, enabling dentists and dental surgeons to accurately assess every fragmented structure in the patient’s mouth. By the end of 2026, over a billion dollar worth of extraoral x-ray systems are anticipated to be sold in the global dental radiology equipment market. In dental institutes across the globe, intraoral radiographic techniques have been a key part of prosthodontics courses. As medical professionals, dentists are sufficiently skilled to operate intraoral x-ray systems. From bitewing projections and interproximal radiography to periapical projections and localization techniques, intraoral x-ray systems have been viewed as a versatile dental radiology equipment. The report estimates that sales of intraoral x-ray systems in 2017 will bring in over US$ 530 Mn revenues in the overall dental radiology equipment market. However, the inability of intraoral x-ray systems to identify and rectify technical errors have influenced their sales in the global dental radiology equipment market. The demand for intraoral x-ray systems is pegged to be restrained to such limitations, making it the second-most top-selling product in the global dental radiology equipment market. Being developed on one of the most breakthrough technology in medical imaging, CBCT equipment have emerged as a key tool for dentists around the world. Both, extraoral and intraoral x-ray systems are being utilized for generating two-dimensional images of dental structures. However, these dental radiology equipment were unable to detect the abnormalities on the third-dimensional surfaces of teeth and mouth. CBCT imaging equipment have stepped in as a relatively new medical imaging technique that offers 3D images. One of the key advantage of CBCT imaging equipment is their ability to generate accurate 3D images at low cost, compared to the conventional computed tomography. The images procured from CBCT imaging equipment have the potential to bring higher efficiency in oral and maxillofacial surgeries. Made of feasibly-procurable materials, such dental radiology equipment are anticipated to witness a steady demand in the global market throughout the forecast period. Being a key product segment in the global dental radiology equipment market, intraoral plate scanners are largely used in small format x-ray diagnosis. Their use in veterinary dental care has witnessed a considerable rise. These dental radiology equipment come in a range of plate sizes, and allow increased throughput and automatic workflow. However, their limitations towards creating high-definition multi-dimensional images will continue to curb their sales in the near future of the global dental radiology equipment market.